LIVIA IS A BEAUTIFUL BLACK/WHITE RON JONES BRED COW. 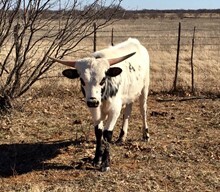 GOOD SIZE FEMALE WITH LOTS OF HORN. EXPOSED TO RATCHET FOR A 2018 CALF.